he Parker "88" was elegedly inspired by the French fashion centre in general, and the French square Place Vendôme in particular, Parker advertised the "88" as a tribute to the beauty of the contemporary European design. The Place Vendôme being "the majestic square that is home to the world's finest jewelers". The history of the Place Vendôme square dates back to 1702 when it was laid out to commemorate the conquests of the armies of king Louis XIV. Later the famous column was erected by Napoléon Bonaparte to celebrate the victory of Austerlitz. The spiraling relief was made from bronze plates made from captured enemy cannons and was designed by Pierre-Nolasque Bergeret. It originally had a statue of Napoléon on top. 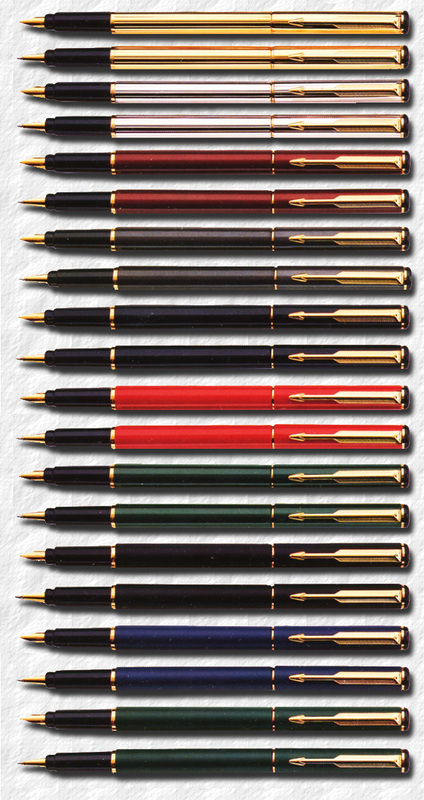 Well the Parker "88" pens didn't really resemble the Place Vendôme column, save in shape, but maybe that was enough. The first Parker "88" had a 22-karat, gold plated stainless steel nib with ruthenium tip which was offered in the sizes Extra Fine, Fine, Medium and Broad. It was fitted with a cartridge or converter and was offered as a fountain pen and capped ball pen. The Parker "88" was in fact introduced in 1987 in the UK, but Parker wanted the name to chime with the release date and "88" looked better than "87", so the official launching year is still 1988. t was in most respects modelled after the very popular Vector, intended to capture the mid size market and also borrowed from the Parker "95", which was designed about the same time, and of course all three are children of the Arrow. The Laque design was created by the application of successive layers of colours to a prepared brass base, creating a very appealing finish while the Matte design featured a brass body sand blasted and sprayed with epoxy resin powder and heat cured to produce a hard-wearing surface. Corinth (longitudinal striped) 22-karat Gold plated, maroon section and button. Corinth Silver Plated, dark green section and button. Laque Maroon with dark green section and button. In the winter of 1989 the Parker 88 Place Vendôme was also introduced in USA while the Matte Black epoxy finish was discontinued. Parker "88" in Corinth gold plated, Corinth silver plated, Laque Blue, Laque Maroon, Laque Ivory, Matte Navy, Matte Maroon and Matte Grey. In 1990 the finish Laque Navy was added to the line. 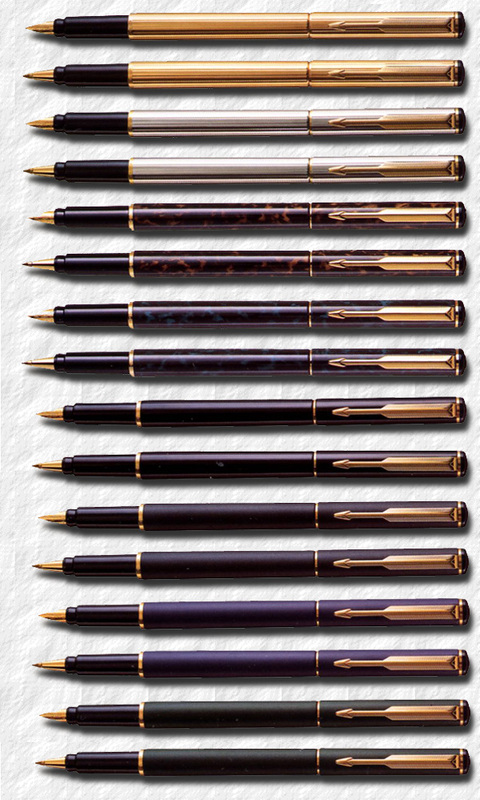 In 1991 Parker raised the prices of the Parker "88" and a new Laque Black with a Black section and button was introduced, while the Laque Maroon and Laque Ivory as well as the Matte Maroon was discontinued. In August of 1992 the complete line of Parker "88" was redesigned. The gold filled pen, trim and nib were now in 23-karat gold and all sections and plastic trim were black, as opposed to the earlier coloured sections. 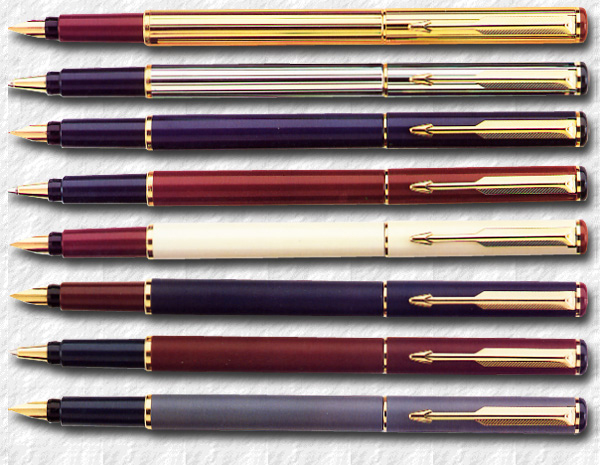 The high end pens were still offered and two new laque metallic designs were introduced in Maroon and Grey. Also two new matte finishes were offered, Matte Black and Matte Dark Green. While the Laque Navy and Matte Grey were discontinued. Parker Rialto:Corinth gold plated, Corinth silver plated, Metallic Maroon, Metallic Grey, Laque Black, Lacky Chinese Red, Laque Dark Green, Matte Black, Matte Nav and Matte Dark Green. Rumour has it that one of the reasons for the name change was that the number "88" was at that time being used by white supremacists. In particular the neo-nazi and klansman David Lane, who was convicted in the aftermath of the murder of jewish American attorney and radio talk show host Alan Berg. Lane was sentenced to 190 years in prison, where he wrote a book in the early 1990's, "88 Precepts", in which he "provides the guidelines for securing the existence of future white children and establishing a white society". The "88" refers to the eighth letter of the alphabet, "H", and "HH" was a code for "Heil Hitler" for neo nazis. Well, although the pen possibly could have found a niche among neo-nazis, Parker probably didn't really wish to be connected to that movement, hence the name was changed. The line was indeed also redesigned although the features were the same. The easiest way to see the difference between the pens is that the later model had "Rialto" engraved on the body band and that the nib was engraved, while the nib of the "88" was not. he only change in the line was the introduction of the Laque Metallic Blue. The Metallic finishes were either too expensive to manufacture or didn't sell very well, since all the Metallic designs except the Maroon were discontinued in 1995. Also the Matte Dark Green was no longer offered. Parker Rialto: Corinth gold plated, Corinth silver plated, Laque Dusk, Laque Aqua, Laque Black, Matte Black, 0atte Navy and Matte Dark Green. his line-up remained until 2006 when the Rialto was beginning to fade. All the laque finishes, save the Black, were discontinued and only six finshes remained. In 2007 Parker made an overhaul of the complete line and discontinued several Parker designs: Parker 100, Insignia, the old workhorse Parker "45", Dimonite, Reflex and the Rialto. In 2008 five new models were introduced: Facet, Executive, Esprit, Contact and Slinger II, but none of these were really a replacement for the Rialto.